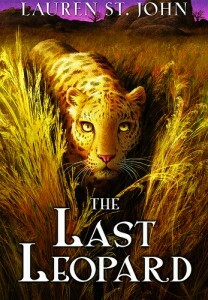 The Last Leopard is the third book in Lauren St. John’s The White Giraffe series. An accident sends Martine, her grandmother and her best friend Ben to the Matobo Hills in Zimbabwe. The hills are home to a legendary giant leopard named Khan – rumored to be the rarest in the world. Martine and Ben discover that Khan is in grave danger from hunters and treasure seekers who will stop at nothing to capture him. To save the last leopard, Martine and Ben will need more than just their skills of healing and bushcraft to survive – they must also learn to trust in the power of their friendship. The Last Leopard is the third book in Lauren St. John’s The White Giraffe Series. Lauren St. John began writing The Last Leopard after learning about a rise in the hunting and killing of leopards in Zimbabwe. Khan, the leopard in this story, is based on a real leopard currently living in an animal sanctuary in Harare. Look for The Elephant’s Tale, the fourth and final thrilling African adventure in The White Giraffe series, in spring 2010.